Why make borax crystal flowers? Well, do you love the look of freshly cut flowers sitting in a vase? I do. But I never buy them because of my cursed black thumb. While most people's cut flowers last for weeks, mine always start turning brown and wilting within a day or two. Last week our craft store had a sale on fake flowers. I was so tempted to buy them, but they looked kinda cheesy and screamed, "I'm fake and I attract dust." Yes. My fake flowers are covered with real crystals... that I grew from Borax. Lovely, aren't they? 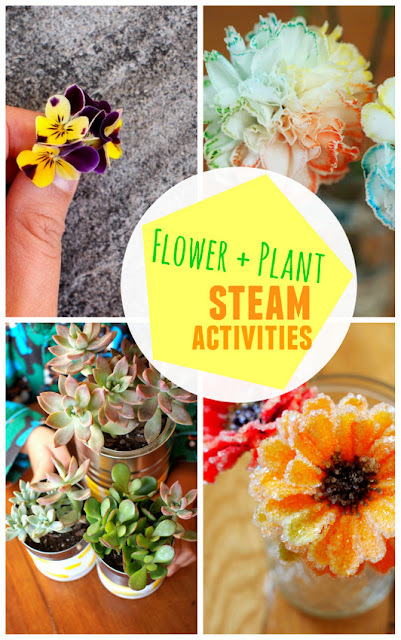 Would you like to make your own frosted-looking flowers? Read on! 1. Remove any leaves from your fake flowers. 3. Boil your water. Pour it into your empty container. Then, dissolve spoonfuls of Borax one at a time until the Borax no longer dissolves. Then, place your flowers into your container and let them sit there for a couple of hours. If your pencils keep rolling, use tape to keep them still. You may have some undissolved Borax on the bottom of your container. That's totally fine. 4. After a couple of hours, pull the flowers out and see how crystallized they've become. When you have enough crystals to your liking, set the flowers to dry standing up. If you're having trouble removing the crystal growth from the bottom or sides of the container, simply pour boiling water into the container again to dissolve the crystals. Enjoy your lovely and sparkly (fake) flowers! Check out these other neat science ideas! My 30+ Favorite Flower and Plant Projects from over the years! Good point. The next time I try this out I'll see how much I used. But honestly I just kept pouring it in until it didn't dissolve anymore. This idea was so very cute. Loved those sparkles BTW.